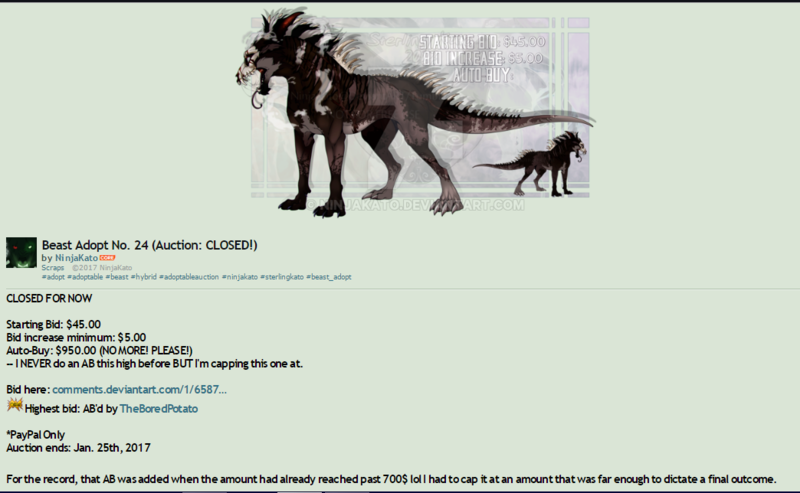 Beware: TheBoredPotato (Scammer) - "Artists Beware"
PROOF: http://ninjakato.deviantart.com/art/Beast-Adopt-No-24-Auction-CLOSED-658794416 (the piece may not be visible to anyone who is not on dA but the description will show. EXPLAIN: On January 21st I posted an adoptable auction which started with a bid of $45 and it grabbed the SB fairly quickly and kind of sat for a while. Then suddenly throughout the day there emerged a bidding war between a one TheBoredPotato and another bidder which got up to some pretty insanely high prices. I had never had anything I drew or made exceed $300 at most so needless to say I was completely floored and chuffed all the same to see this happening. TheBoredPotato seemed to be serious about their bids as they kept going, claiming they were running out of money but then somehow had gained more money in the middle (*see the bidding chain above) and it kept going on and on and on. When it finally hit $700 the other bidder noted me asking me when I was going to put up an AB price so they could AB it and I told them I'd cap it at $850 since I was still reeling from what was happening. By the time I went to cap the auction at $850 TheBoredPotato had already bid $900 https://i.gyazo.com/49187c9d4b8808aa886686941b09fef9.png and then bid $1,000 https://i.gyazo.com/24f334d52099b16249be4b18c043040c.png which needless to say nearly made me faint. Anyway, I capped the auction at $950 and TheBoredPotato agreed to pay that amount and I thought everything was sorted -- the other bidder was gutted she didn't win (I know the other bidder) but accepted the loss. They agreed and sent $150.00 right away via the Gift option on PayPal -- https://i.gyazo.com/456e6088369a678e704698cdd8c3ab9e.png without my invoicing them but I had no reason to believe they weren't legit -- after all, they bid nearly a grand on something, I figured you'd be legit enough if you bid that much. They also stated they were basically minted -- https://i.gyazo.com/bb502fd0a83a96da5c791f660baff926.png claiming their parents paid them 1k a week; I should have seen that as a red flag but rich people exist so... I just assumed. Anyway, after the $150.00 I figured I'd invoice them for the next payments so I could track them but they never told me when I could invoice them so I waited, then on the 22nd I got another $100 http://sta.sh/027nzr3nsbzv which they sent again via the gift option. 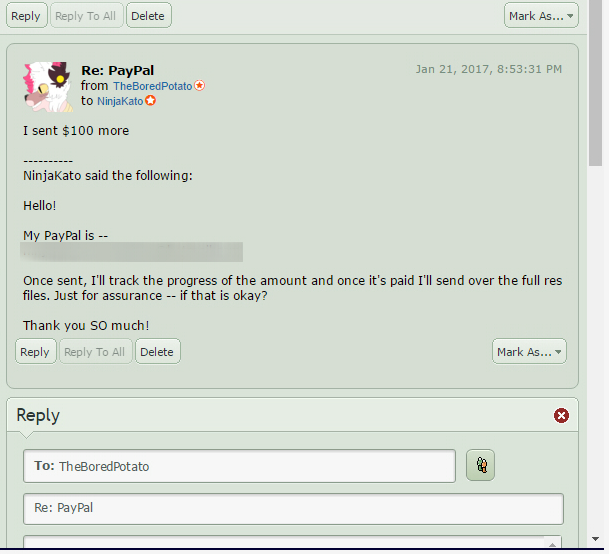 At this point I was a bit uneasy about it but all the same they seemed legit and had even had a bit of a discussion with me about how much they'd wanted a piece of artwork from me and that after they paid this adopt off they'd commission me -- https://i.gyazo.com/46445f158107a091bd9958f9ebe5bdc0.png (this was the 21st still but still relevant). Now, that didn't alarm me but then I got this as well -- http://sta.sh/0wk41xody9z after I replied to their initial note wishing them well (it sent a day later because it had landed in my drafts folder somehow so it didn't send). The part that tripped me off was that their profile says they are 15 years old -- https://i.gyazo.com/4e001cc9d09a6dd47e028364a8276514.png and I immediately wondered why a 15 year old kid would have to even think about fronting their parent's medical bills; more so if their parents were so rich they could give their kid 1k a week... It began to make little to no sense. However, at the fault of not sounding like a douche canoe I thought it best to give them a bit of time since if something did happen they would need some time to assess their finances and life situation to see if they could continue paying. On the 26th I finally sent them a note http://sta.sh/01q1d9mm2gsv to inquire about whether or not they could continue to pay and if they couldn't I'd refund them the $200 they'd already sent and give the adopt to the other bidder instead (the other bidder; who I later found out couldn't afford the adopt anyway since after losing they spent their money elsewhere respectfully). They replied with http://sta.sh/01p5blmxg907, http://sta.sh/01bq6ypajaeh, http://sta.sh/02amvrfc3njl and at that point I realised I was likely being had and I had also inquired with the other bidder about taking the adopt to find out they couldn't afford it either. So, needless to say at this point I was a bit gutted that I had not only lost a $950 bid but was also being wrung out. It all felt a bit too fabricated but again, I didn't want to be a jerk about it so I just went with it as best I could. 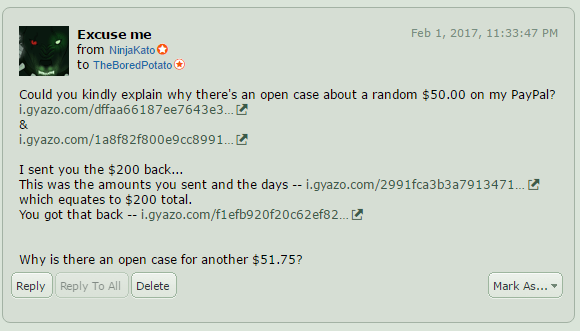 I thought everything was said and done only to find myself slapped with a PayPal dispute filed against me on February 1st-2nd, for a sum of $51.75 from the same name and address TheBoredPotato had used -- http://sta.sh/01vgqkdanipc so I checked it out and then called PayPal. A bit of time talking to them and then found out that I hadn't refunded them $250 which was the amount they sent. One of the $50.00 payments wasn't showing up in my activity so I was unaware of it was even sent. However, since it showed legit I figured I'd just allow that $50 to be refunded; after all it was part of their original payments they'd sent ($250) and it was my mistake for not seeing it and refunding it. So I thought that was all said and done but then 4 more disputes open up for sums of $51.75 -- http://sta.sh/0866mp5s5xs all within 2 hours and for the amount in which TheBoredPotato had sent -- $250. 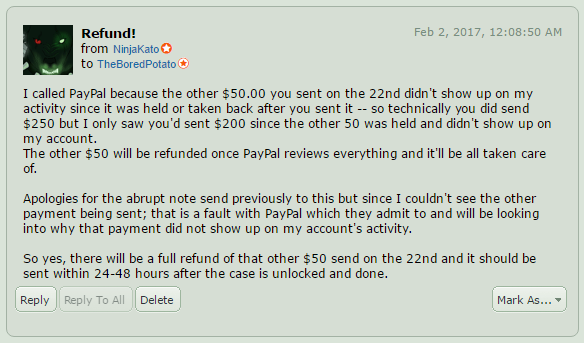 Now, I had already refunded them $200 of that $250 and it was too late at this point to call PayPal so I messaged TheBoredPotato about it https://i.gyazo.com/c0d05a5632e6f0de4516d1ac24daec2c.png and got no reply but after calling PayPal I sent them another message conceding to the $50.00 charge -- https://i.gyazo.com/454c22156bbb936324b72283603e9d72.png and offered to refund it to them once I could. However, after the next 4 disputes opened I was livid and felt like I was being scammed; I'd refunded them $200 already and they were trying to grab another $200? Nope. So I noted them again -- https://i.gyazo.com/9b30fc92d74d1bf1cd96cc03058c0ad6.png and got no reply. I'd posted a dA journal about it explaining the situation to see if anyone else had had this happen only to find out some interesting information including but not limited to the fact several other people had had the same exact thing happen to them as well with TheBoredPotato. TheBoredPotato finally commented (didn't reply to my notes mind you) on the journal -- https://i.gyazo.com/4f51ad1963a15f876e43c393d8b25f1c.png claiming it wasn't them, later claiming they were hacked. I can also safely say there's several other people who had the same thing happen although I am not sure any others were as high as $200 worth of false disputes. 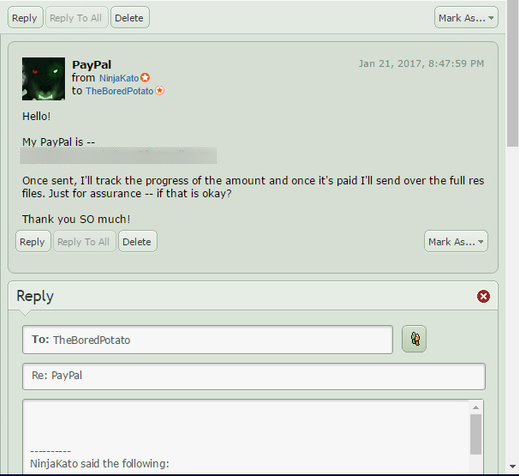 They went on to claim hacking and all that but it was explained to them how to fix the matter and I had already called PayPal to verify all that happened -- they also were able to tell me that they were 100% positive TheBoredPotato's account wasn't hacked. The amounts were too specific AND hackers usually clean out accounts, they don't bother with charge backs, and even then, it was their card company/bank that had filed the charge backs. They continued to play innocent until they finally buggered off and haven't said a single word since. Meanwhile people's money is being withheld from them because of these charge backs and I myself am out another $200 because of it -- and without TheBoredPotato cancelling the disputes/charge backs I'll likely be waiting 30-75 days before that money is released back to me; if I win the case that is. My main fault is that I didn't refund each payment of $50 they sent me and instead just sent them the $200 back in full via the gift option. That was MY mistake. However, their avoidance tactics and lies are the main concern. End case and point is they likely grabbed their so called grievously injured parent's card/PayPal, spent a lot of money, parents saw all the transactions happening and they called their bank to file charge backs since they hadn't bought all this art/character/etc. The $200 I refunded them would by all rights be in their PayPal still unless TheBoredPotato spent it already and therefore their parents don't know it was refunded or even was there in the first place. The fact that TheBoredPotato's first reaction was to 'HOW TO BAWLETE PAYPAL!?' rather than seem shocked and concerned about the situation shows they likely got caught redhanded and are now proceeding to pretend if they go away then this situation will go away and they'll get away with it. They haven't tried to resolve the situation and they didn't bother to so anything but cancel 1 of the 5 charge backs on me. I don't know if they did anything for the other people whose money was withdrawn from them. So, my warning is DO NOT DO ANY DEALINGS WITH THIS PERSON! They are a liar and a scammer. The fact they used 'my parents are dying' as an excuse to be irresponsible is not only low but sad -- https://i.gyazo.com/4d5fc5c6426f753a1bb265d27dbe9c34.png not the most eloquent of comments to show but as you can see they still go with the parents dying thing. If their parents were dying then I'd only assume they wouldn't be in hospital or hospice going 'what's with all these charges on my credit card/PayPal?'. I don't know if anyone else had this happen with this person but yeah, lesson learned. NEVER let anyone just send you money on PayPal; more so via the gift option. It gives them a lot more power to file a false charge back if they so want. I'll update if any further information comes in but at this point I am pretty sure TheBoredPotato has buggered off and will likely start anew and pretend nothing every happened. I guess this means they have grabbed $470 from me since I had already refunded them $200 from their original $250 they'd sent, and unless PayPal can get their parents to refund me my original $200 that I sent them as a refund. I did call PayPal and they said they would attempt to get a refund of the original $200 that I sent them -- that's IF the person or parents respond to a PayPal email or phone call and concede to refund me that $200. However, given their history of NOT answering emails (I sent them one already) that is looking bleak. So not only are they getting more money from me than they paid but they are also getting ME to front the fee for it. I'm just... I can't even be mad right now. I'm just floored. Absolutely and utterly floored. I've called and talked to PayPal and they are doing what they can to get my money back but there's only so much they and I can do with people who won't respond right now so... I'll update when I can and if I get my money back. I'm really not happy about this. You'd think given Paypal's own ToS they would have closed the case automatically due to it being a "gift", but what a mess. I hope you're able to relist the adoptable, too. It's utterly gorgeous. Yeah you'd think so but there's regulations and such that go on with card companies so they have to go through with it if it's filed from the card company -- which tells me that TheBoredPotato either spent someone else's money and they found out, or something else happened. I was able to and the other bidder who fought TheBoredPotato for it was able to AB it -- for far less but at least it found a home with someone I know and trust.